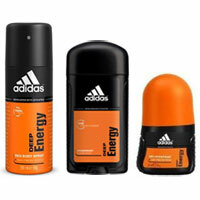 Adidas soap, shower gel, lotion and fragrance list. Cleans and leaves skin refreshed and lightly scented. Anti-perspirant spray, deodorant stick, and roll-on for women. Anti-perspirant spray, deodorant stick, and roll-on for men. Adidas bath and body care: Founded in 1949 by German brothers Adolf "Adi" Dassler and Rudolph Dassler, Adidas is a global sports brand who partnered with Coty in 1985 to develop their personal care products and fragrance division. Shop for bath & body fragrance: Walmart - Introducing FREE 2-Day Shipping at Walmart.com!